ICS-based slate packs in a 0.3 mp front camera, 1 GHz CPU, and external 3G dongle support; comes with educational courseware. Android 4.0 (ICS) with support for Google Play. 7" multi-touch screen with pixel dimensions of 800x480. 0.3 mp front camera with video recording. Allwinner A13 chipset, 1 GHz Cortex-A8 CPU with dual Mali-400 GPU and 512 MB of RAM. 4 GB internal storage, 32 GB microSD card slot. Wi-Fi, USB 2.0 with support for 3G dongles, Bluetooth NOT supported. 3.5 mm jack, gyroscope Orientation sensor. Supported audio formats: MP3, WMA, MP2, OGG, AAC, M4A, FLAC, APE, 3GP, WAV. Supported video formats: MPEG, H.264, DivX, XviD, RM, RMVB, MKV, WMV, MOV, MP4, AVI, allows 1080p playback. According to the official product page, Micromax also offers interactive study material with this tablet for all classes, sample papers for various entrance exams, and video tutorials. However, the courseware and videos will have to be individually purchased from the company's official store. 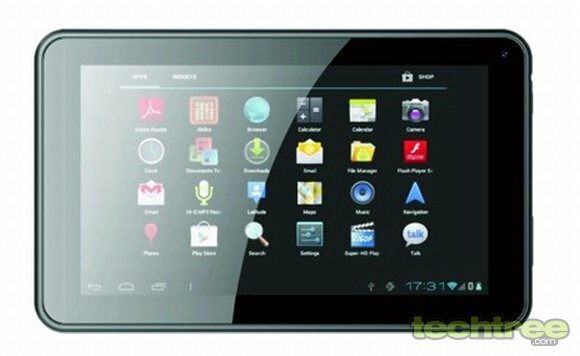 The tablet is priced at Rs 6000, and can be purchased here.